Description: Typical smell of natural grain, free from strange odors, light yellow color, free from foreign matters. NON GMO. Specifications: there are three types according to their final usage: food, feed and malting. Packing: Polypropylene bags of 40 kg, big bags of 1.000 kg. In containers and/or in bulk. Recommendations for appropriate storage: Keep in a dry and cool place, preferably below 18°C. Storage facilities must be fumigated, controlled and ventilated and must be free from insects and from products which cause contamination. Validity of the product 24 months from packing date if properly stored. Known by its scientific name as Hordeum Vulgare, barley is a cereal called ordi, in Catalan; orgo Galician orge in French, and garagarr in Basque. Original from the margins of the Caspian Sea, it was the first cereal which began to be cultivated by man. Nowadays is the most extended crop in the Northern European countries, although does not resists cold as much as rye or oats, but it is grown in those countries due to its high rate of vegetative growth, allowing it to be planted in the spring. Resists heat and drought better than wheat. In the Centre for agricultural crops of Swaiót (Sweden) was obtained recently a new type of barley, called híproly, that apart from containing maximum levels of protein, adds to its composition an amazing amount of lysine, an essential amino acid, normally found in meat. After taken the outer layers from it, you obtain the cleaned barley. Polishing it mechanically, we obtain the product called perlada. After crushing it and separating it from part of its flour, barley flakes are obtained. The gross and thick flour is the barley meal. Having less gluten content than wheat, its flour, when mixed with water produces an elastic paste, which is not easy to make bread. However, in the past, bread from barley was usual (most of the times mixing it with some wheat flour). This bread, very brown, heavy and difficult to digest and not so rich in nutrients as wheat bread, however, was highly appreciated by agricultural workers, for the sense of fullness it gave them. It had also the advantage you can store it for longer periods than other breads. In some countries of Northern Europe and Asia this bread is still cooked. Barley is a cardiac tonic food, restorative, digestive, hepatic activator, refreshing and hypertensive. According to Kozel, the food value of barley is not appreciated as it should be. It is an excellent cereal, better than rice and maize. It is richer in phosphorus, so it's a general and nervous tonic. Contains fluorine, necessary for healthy teeth and bones. In addition of bread made from barley, you can eat it in the form of soups, purees etc, as if it were wheat or oats (flour, meal, flakes, etc.). They deserve a special mention for being very healthy, water barley and malta. Is prepared by mixing 100 grams of barley with enough cold water, so that after boiling for half an hour, a litre of the final product is obtained. Once cooked, is left to sit for a few moments and filtered through a cloth of etamín, The water obtained, can be drink as it is or sweetened with honey or sugar; it removes thirst, its diuretic and contributes to the maintenance of the patient, very useful against digestive disorders. Barley water was one of most used drugs by Hippocrates. In summer, cooled with ice and lemon juice, is a very refreshing drink. With water, barley and sugar, a candy called alfeñique was prepared in the past, consisted of thin and twisted bars, good against cough and hoarseness of the trachea. 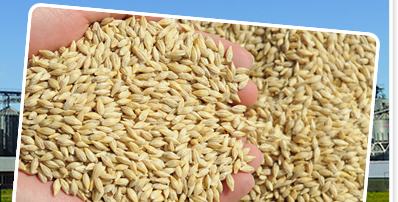 With germinated barley grains a product of great importance called malt is produced. Although you can also get it from other cereals as well, the real malt is made from barley. During germination, barley embryos produces a notable alkaloid called hordenina, similar to that one produced by some Mexican cactus called peyott. It acts very similar to the well known adrenalin. Roasted malt is used as a substitute for coffee; this infusion is dark and has a strong smell. Sometimes is added to the coffee to strengthen its aroma. Those who cannot drink caffeine can consume malt to replace the coffee. The malt extract is used as food and medicine, particularly for patients who need to eliminate toxins from animal food. Malt, either in powder or extracted fluid, added to soups, facilitates the digestion and its recommended in the feeding of children, tired patients, as well as elderly people. Malt is finally used to produce beer. Golden beers or pale such as Pilsen, Munich and San Miguel, are produced with little roasted malt. Black and more or less dark beers, with very roasted malt.